Itanagar Sep 15 (IANS) Arunachal Pradesh Governor Brig. B.D. Mishra (retd) on Friday called upon various security organisations in the northeastern states to have good coordination between them in tackling insurgents. 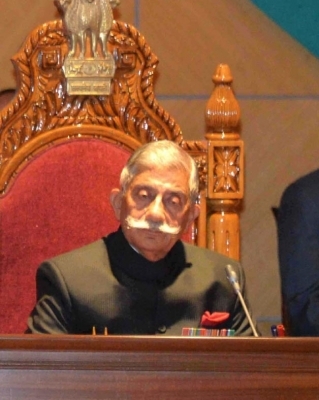 Mishra was addressing the 25th Conference of DGPs IGPs and heads of central police organisations of the northeastern states at Darbar Hall in Raj Bhawan here. He also warned that delayed action no action or "live and let live" policy towards insurgents reportedly in some case are likely to erode the confidence of the people in security organisations. Mishra highlighted the importance of the constables security scenario of northeastern region emerging security challenges and suggested ways to tackle the security challenges while recalling the history of police and policing in India. On inter-state security issues the Governor called upon the police chiefs to convene regular meetings among the organisations and bring those issues to logical end. While suggesting methods for strengthening the police forces from all angles to counter the emerging security challenges the Governor stressed the need for transparent recruitment effective training police reforms in equipment weapon and communication means conducive political ambience and rank and command and control integration. The Governor also suggested synergy of efforts amongst the security forces and promoting Good Police work. Sharing his experience as Head of Black Cats Mishra suggested for remedial measures to control insurgency in a democratic setup which include good developmental policies and programmes work opportunities and job creation e.g. stand up policy entrepreneurship development schemes "Sabka Sath Sabka Vikas" oriented political leadership good intelligence good policing effective local administration quick and fair justice transparency and honesty in governance good roads and good communication network proper education and effective counter insurgency military operation.